for iPhone,iPad,iPod Touch with Lightning Connector. Streams well to 2 sets AirPods. 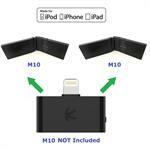 Made for iPod iPhone iPad, for iPhones/iPads/iPod Touch with Lightning Connector. (NOTE: NOT for use with iPod nano 7). 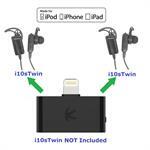 Works well dual-streaming to 2 (Two) sets (each set = 1 left + 1 right) Apple AirPods for 2 persons. 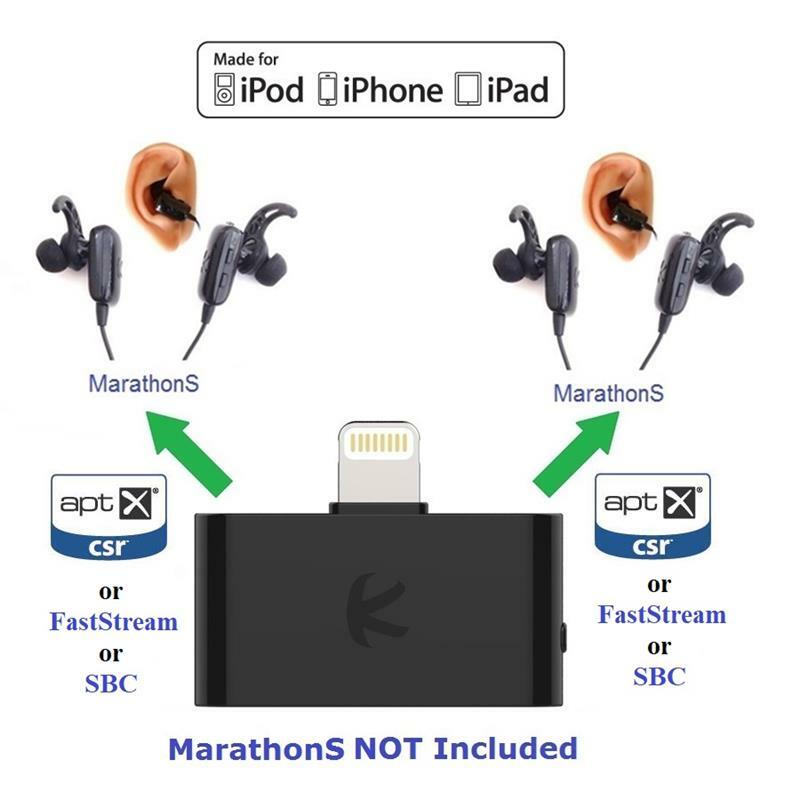 DIGITAL multi-streaming Bluetooth stereo transmitter splitter with switchable aptX / Low-Latency aptX / FastStream / SBC codecs, transmits to 2 (Two) Bluetooth Stereo Headsets / Receivers / Speakers. i10L_Pro enables user to easily toggle (using button) between classic aptX , low-latency aptX , FastStream or standard SBC codecs, to select the preferred codec (quality , latency) according to use case and the codecs supported by headset/receiver/speaker. Implements A2DP and AVRCP profiles, with remote controls for Next/Previous/Play/Pause. 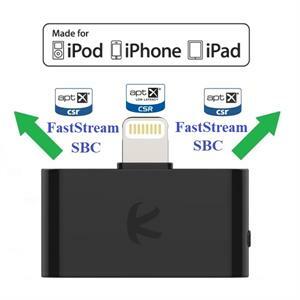 In one extremely tiny size and light-weight package at 30mm X 16mm X 7.25 mm and 3g (1.18” X 0.62” X 0.28” and 0.15oz) with high performance and unique features designed for iPhones, iPads, iPod Touch with Lightning Connector. 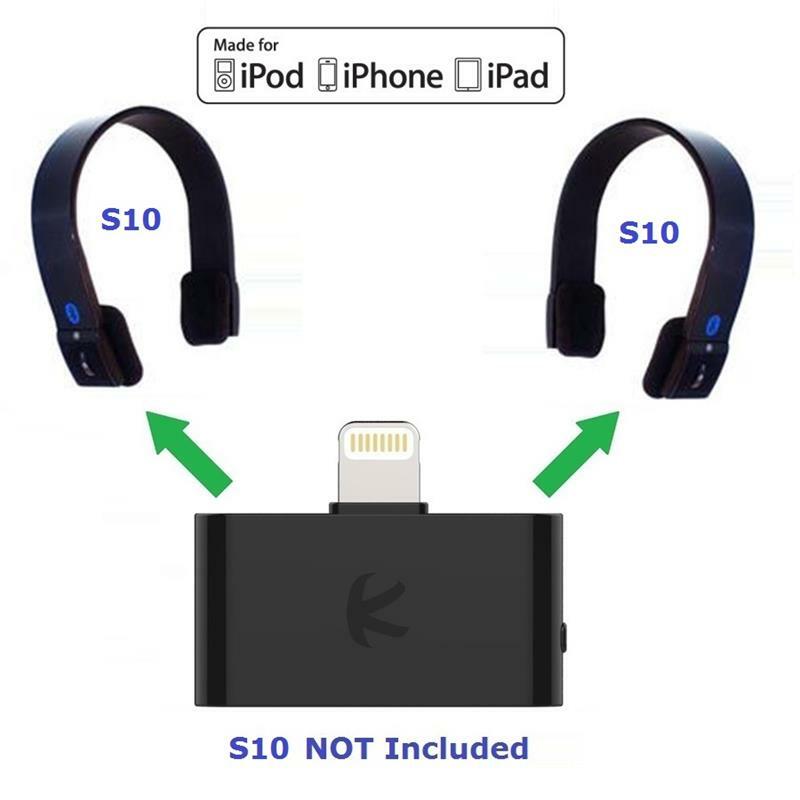 Plug and Play : Put your device in pairing mode, plug i10L into iPhone/iPad/iPod Touch, i10L auto pairs and connects to your stereo headset/receiver/speaker. Put 2nd device in pairing mode, press button on i10L to pair, connect and stream to both devices. DIGITAL MULTI-STREAMING Bluetooth stereo transmitter splitter with switchable aptX / Low-Latency aptX / FastStream / SBC codecs, allows simultaneous enjoyment of iPhone/iPad/iPod Touch music/audio with up to 2 persons/receivers. For example, two persons, with 2 different sets of Apple AirPods, can enjoy the music/audio from the same iPhone/iPad/iPod Touch. i10L_Pro enables user to easily toggle (using button) between classic aptX , low-latency aptX , FastStream or standard SBC codecs, to select the preferred codec (quality , latency) according to use case and the codecs supported by headset/receiver/speaker. i10L_Pro is the first product in the market that provides such a feature, so the user is not locked to using a fixed codec. 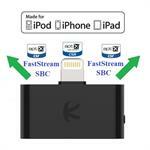 NOTE: that multi-streaming to 2 devices is possible with classic aptX, FastStream and standard SBC codecs. When Low-Latency aptX is selected, only single-streaming to 1 device is possible. i10L will respond to Receiver Remote AVRCP commands (Play, Pause, Next, Previous). 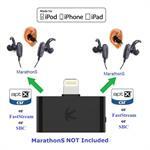 Low power consumption, for many hours of wireless audio enjoyment with iPhones, iPads, iPod Touch. 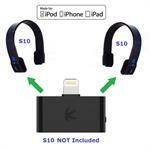 No batteries needed, powered by iPhone/iPad/iPod Touch. 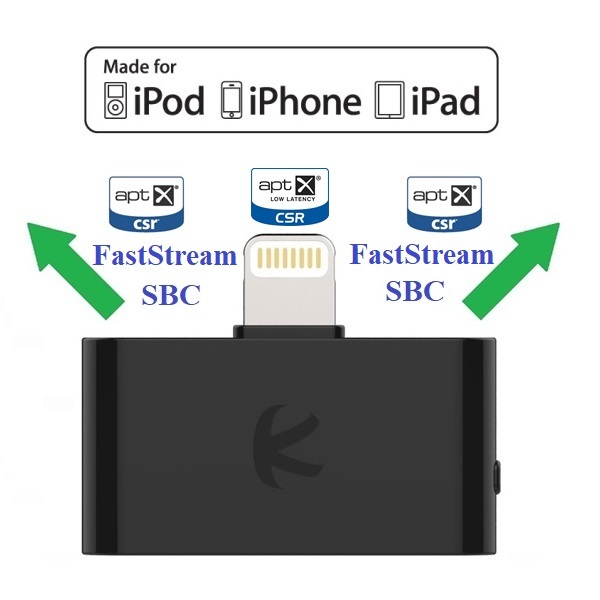 Attach to iPhone/iPad/iPod Touch via Lightning connector. 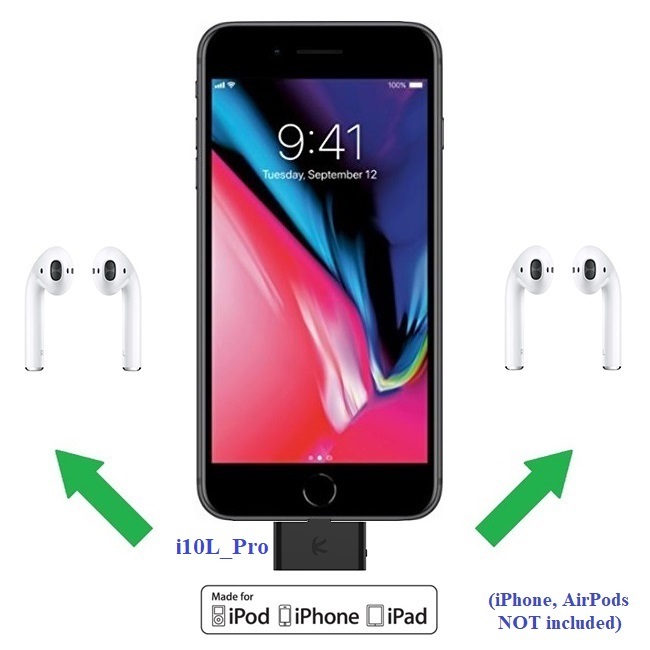 Works with iPhones/iPads/iPod Touch with Lightning Connector. (NOTE: NOT for use with iPod nano 7).